“Measure twice cut once” of Charles Hadcock at Art Moorhouse. Hadcock’s exhibition “Measure twice cut once” is interesting, at Art Moorhouse. It is an exhibition of Drawings, Maquettes and Sculpture by Charles Hadcock FRBS. The title itself, “Measure twice cut once” plays with the old English proverb that wants to Plan and prepare in a careful, thorough manner before taking action. Charles Hadcock’s monumental sculpture reflects his interest in geology, engineering and mathematics and is enriched by references to music and poetry. In his work, the naturalistic side of the world and geology is mingled together openly, or as hidden jewels. Charles Hadcock observes and utilises forms within the natural world which are often the source for solving practical design problems. His direct observation of rock surfaces, for example, has provided sources for the surface of his sculptures, while at second-hand he has appropriated items such as designed or engineered solutions for packaging, and machinery of various types. These, cast in other materials become components for his sculptures. Charles Hadcock uses mathematics for planning how a sculpture will work. Free hand design and draws are less practical than an elaborated project that analyses solids in three dimensions. Calculating how a sculpture can be segmented into identical shapes, so that casting from a single form may be achieved with economy, needs a mathematical mind. This process may result difficult t understand but it refers to the proverb of the exhibition’s title “Measure twice cut once”. 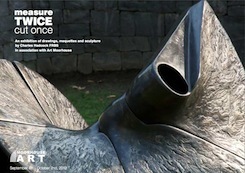 Charles Hadcock works it with visual vitality, so that the sculpture remains free and dynamic, unrepressed and direct. He works creatively with number, as in Fibonacci numbers and the Golden Section, based on his own body height in many of his sculptures, rediscovering past system of calculation of the body in art, when the Fibonacci was an inescapable fact. The multiple, whether made by Hadcock or appropriated by him from elsewhere, emerges in his work. Charles Hadcock is born in Derby in 1965 and now lives in the North West based in Preston. He studied fine art at the Royal College of Art, London (1987-89), specialising in sculpture and in 2008 was made a fellow of the RBS. In April 2007 he was made a recipient of the Queens Award for Enterprise Promotion. Charles Hadcock has many works on permanent display in London including, “Torsion II” and “Helisphere” in Canary Wharf, “Cantus” in Shoe Lane, “Installation” in Siddons Lane, “”Couplet” in Chiswick Mall, “Caesura IV” in Deptford Bridge, “Accord” in London Bridge, “Installation” Jermyn Street, and “Echo” in Rossmore Road. Besides, he has other works in permanent display in Brighton, Yorkshire, Lancashire, Manchester, and Bordeaux (France). « Korean art of Sung Hwan Kim at The Tate Modern Tanks.